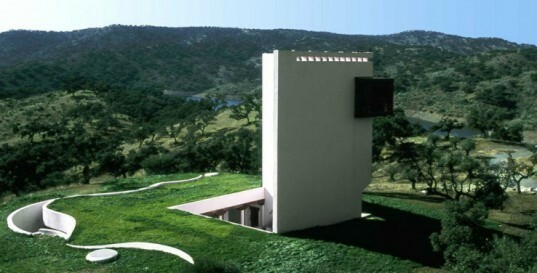 Emilio Ambasz's iconic house just outside of Cordoba, Spain, is a stunning example of modern architecture infused with sustainable design principles. Constructed in 1975, the Casa de Retiro Espiritual overlooks a lake and is sited on a once treeless outcrop of land, which today is populated with olive trees. Acknowledged as a “forerunner of green architecture”, Ambasz brought his preoccupation of fusing architecture with nature into the design of this home, and rather than building atop the land, the architect decided to dig deep into the earth. What Ambasz created was a spectacular bermed structure that takes advantage of natural cooling and insulation, but still maximizes natural light despite being built below ground. 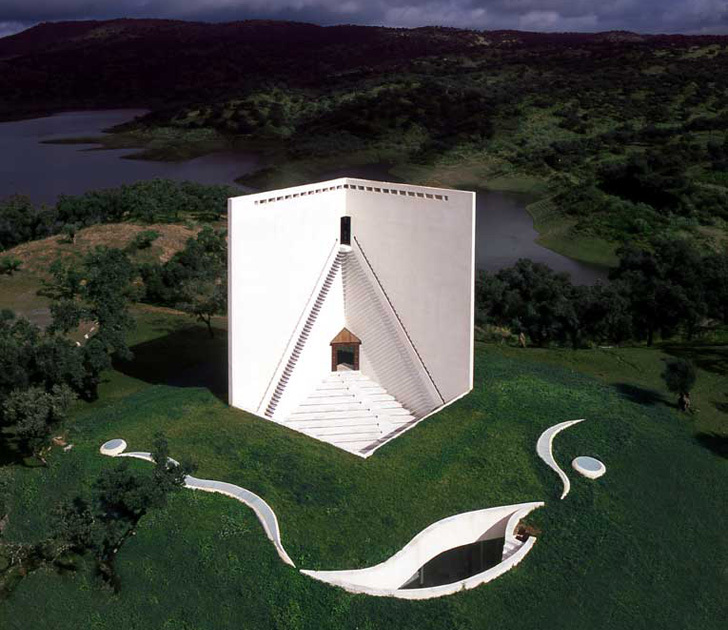 While the home is conscious of its surroundings, this design is not meant to shrink away from sight; the entrance to the home is marked by two tall, angled, white walls that create a near numinous presence on the serene land. The house is constructed around a formal square patio that is accessed via the entrance’s sweeping above-ground steps. All of the rooms of the home have been oriented to open up to the patio in order to take advantage of the outdoor living area and the temperate weather. Glass makes up the exterior walls, pulling in the light reflected off the tall white walls that rise above-head and encase the house. A spectacular balcony with views to the lake and hills sits high up on the edge where the two walls meet. The walls have been oriented towards the north to both shade the balcony and protect the home for northern winds. To reach the balcony, two cantilevered metal stairways are flanked on one side of the wall, and water cascades within the deep grooves of the handrails. The water is collected at the bottom of the stairs in a central semi-circular fountain. The interior has been built as a large continuous space, defined on one side by a long sinuous wall. Rooms have been excavated from the depression and built as alcoves. A smooth finish on both the floor and ceiling helps wash the interiors with a soft atmospheric light that enter through skylights. All practical needs and services (kitchen, baths, storage, etc.) are satisfied by containers placed adjacent to the living room. Construction followed the practices of local builders, and the home uses concrete, earth and bricks. Insulated double walls and slender columns support a concrete roof, and to keep the house cool during hot and dry summers, the roof has been covered in lush grass. This is why I'm voting for Jill Stein in 2016 for President. She is the only one who wants to end Homelessness and People being shacked to heavy debt for home ownership. How much is this $$? The house is constructed around a formal square patio that is accessed via the entrance's sweeping above-ground steps. All of the rooms of the home have been oriented to open up to the patio in order to take advantage of the outdoor living area and the temperate weather. Glass makes up the exterior walls, pulling in the light reflected off the tall white walls that rise above-head and encase the house. A spectacular balcony with views to the lake and hills sits high up on the edge where the two walls meet. The walls have been oriented towards the north to both shade the balcony and protect the home for northern winds. To reach the balcony, two cantilevered metal stairways are flanked on one side of the wall, and water cascades within the deep grooves of the handrails. The water is collected at the bottom of the stairs in a central semi-circular fountain. The interior has been built as a large continuous space, defined on one side by a long sinuous walls. Rooms have been excavated from the depression and built as alcoves. A smooth finish on both the floor and ceiling help wash the interiors with a soft atmospheric light that enter through skylights. All practical needs and services (kitchen, baths, storage, etc.) are satisfied by containers placed adjacent to the living room. Construction followed the practices of local builders, and the home uses concrete, earth and bricks. Insulated double walls and slender columns support a concrete roof, and to keep the house cool during hot and dry summers, the roof has been covered in lush grass. Many of Ambasz’s projects focus in on features such as the presence of light, the rumor of water, the manipulation of perspective and the inhabitation of space. “I have always striven in my work to present alternative models of the future so that we can change the present," Ambasz once said. "If there is any strength to my architectural ideas, it comes from the fact that I believe that architecture has to be not only pragmatic but also move the heart."